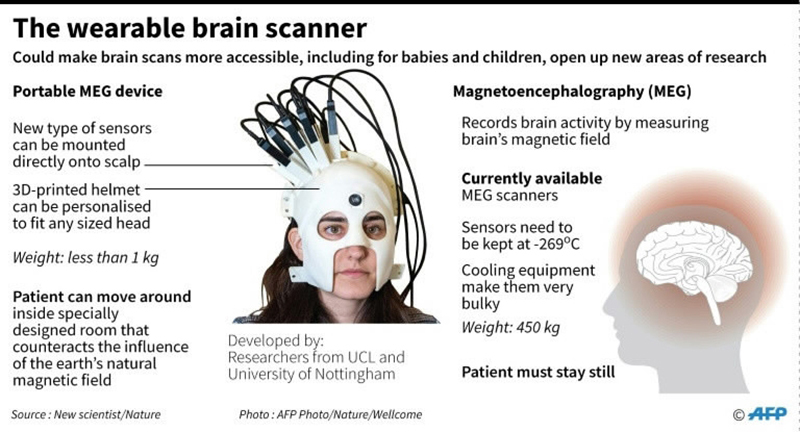 British scientists on Wednesday unveiled a next-generation wearable brain scanner that can be donned like a helmet and allows patients to move freely while being scanned, potentially revolutionizing neural care for children and the elderly. Researchers hailed the “transformative” imaging set-up, which for the first time gave them access to brain activity while patients make natural movements, including nodding, stretching and even playing ping pong. “It gives us a new kind of brain scanner that allows us to study things we’ve never been able to study before and people who have never been able to be scanned in a neuro-imaging environment – patients from groups like children, for example,” said Professor Gareth Barnes from University College London, who worked on the project. Current magnetoencephalography (MEG) scanners use sensors to measure the brain’s magnetic field that needs to be kept extremely cold – minus 269 Celsius, or close to absolute zero – requiring bulky cooling technology. They typically weigh around half a tonne (1100 pounds) and patients must remain perfectly still to not disrupt the brain images produced. This makes it hard to scan patients who are unable to stay immobile for long periods, such as young children or those with movement disorders like Parkinson’s disease. The new scanner, developed by researchers from UCL and the University of Nottingham, does away with the need for cooling by using state-of-the-art “quantum” brain sensors, which represent two giant leaps in scanning technology. “These can be mounted directly onto the scalp surface so we can bring them into much closer proximity to the brain and that increases the amount of signal that we get,” said Matthew Brookes, associate professor at the University of Nottingham. 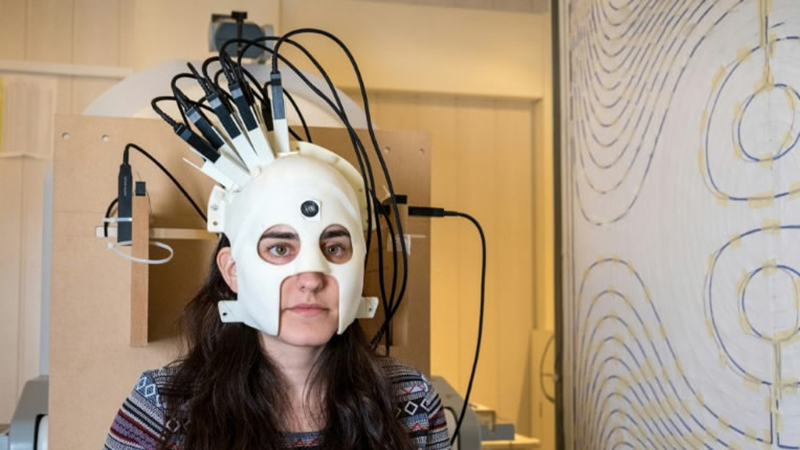 In a paper published in the journal Nature, scientists from the two universities showed patients performing a range of physical movements while the scanner helmet took images of their brain’s magnetic field. They were able to measure vast differences in electrical activity in certain areas of the brain depending on the activity performed – be that playing table tennis or sipping a cup of tea. “We can get a full image of what the magnetic field looks like outside the brain,” said Brookes, allowing researchers to see which areas of the brain fire up as patients do different tasks. In order to gain a clear view of the brain’s electrical signals, the team first had to develop a system of electromagnetic coils that canceled out the Earth’s natural magnetic field around the patient. The new technology – which is highly customizable and can fit over children’s heads as well as adults’ – could revolutionize the way doctors and surgeons treat patients suffering from neurological disorders. “We think these sensors will help the surgeons better target where they operate and speed up the process,” Barnes said. The technology would also render some surgeries unnecessary, and allow for earlier treatments and earlier diagnosis, he added. The team is already working on even more customizable, bike-helmet style scanners that they predict could provide brain images four times more accurate than today in adults and 20 times clearer in children. “This technology has transformative potential across a range of neuroscientific and clinical applications,” it said.